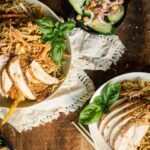 Quick, easy, and the perfect way to use up leftover smoked chicken, this Spicy Thai Peanut Noodle Salad with Smoked Chicken is a new favorite of mine! Heat a large skillet over medium-high heat and saute the veggies in 1 tablespoon sesame oil until just softened, 5 to 7 minutes. Remove from heat, season with salt and allow to cool. Whisk the remaining 2 tablespoons sesame oil, peanut butter, sweet chili sauce, sriracha, and honey together in a large bowl. Add the minced garlic and Thai red pepper along with a pinch of salt. Toss in the cooked pasta to coat. If desired, add the chopped chicken, or serve the pasta in a bowl with the smoked chicken atop. Garnish with crushed peanuts and fresh basil. Replace the Thai Chili with crushed red pepper flakes if desired. Be sure to add a bit at a time, to taste.